Casseroles, stews and other dishes that are cooked in a covered pot or casserole dish. 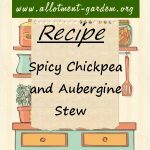 Recipe for Spicy Chickpea and Aubergine Stew. Full of the spicy flavours of the middle east. Serve with rice, couscous or flat bread. Enough for 4 people. 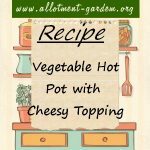 Recipe for Vegetable Hot Pot with Cheesy Topping. You can use different veggies but try to keep the overall weight around the same. Enough for 6 people. 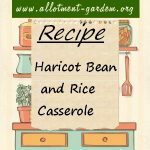 Recipe for Haricot Bean and Rice Casserole. As well as the beans and rice, another way to use peppers, courgettes and aubergines. Serves 4. Recipe for Newcastle Brown Ale Stew. Can be served with the potatoes on top or with a bowl of new potatoes separate. Also good with dumplings. Recipe for Winter Chicken Casserole. Should serve 4 people and only takes 15 minutes to prepare. Recipe for Vegetable Hotpot with Dumplings. Serves 4. A couple of tablespoons of unsalted peanuts added at the same time as the cauliflower etc works well. Recipe for Jerusalem Chicken. 4 good helpings. Serve with other vegetables of your choice but goes really well with green beans and baby new potatoes. This Leek and Tomato Casserole Recipe produces an easy-to-make vegetable dish that can be served on its own or with roast beef or pork. Recipe for Spicy Beef and Pepper Casserole. Serves 4 - 6. Goes well with boiled rice or new potatoes. Recipe for Pasta Hot Pot. Garnish the top with a few spring onions. For a more filling meal, hand round some grated cheddar cheese. Serves 4. Recipe for Vegetarian "Paella". Garnish the top of the "paella" with a few black olives or some fried mushrooms along with some thin strips of red pepper. Recipe for Potato Goulash. A tasty vegetarian goulash that serves 4. Small portions of long grain white rice goes well with this. Recipe for Indian Style Vegetable Casserole. Serves 4. Peas can be used instead of broad beans. Recipe for Belgian Stew. Serves 4. A very filling main course meal. Recipe for Aubergine Casserole. A delicious summer dish that can be served hot or cold. 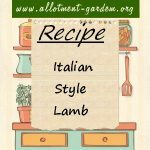 If serving hot, an ideal accompaniment to grilled or roast lamb. Recipe for Broad Bean and Bacon Casserole. Lovely with your own broad beans straight from the plot. You can also put some new potatoes in it. Recipe for Ratatouille. A simple stewed vegetable dish from the South of France. Serve with a hunk of bread or steamed rice to make it more filling. Recipe for Pasta and Vegetable Hot Pot. A filling vegetable and pasta hot pot enhanced by the taste of ginger. Serves 4. 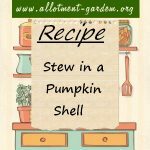 Recipe for Stew in a Pumpkin Shell. An ideal recipe for Bonfire Night or Halloween or any autumn gathering. Recipe for Runner Bean Casserole. Provides a light vegetarian meal on its own or can be served with sausages, bacon etc. Serves 4.